Since ancient Egypt, swordfighting has been a sport and has been practiced in many forms in various cultures since then. Although jousting and tournament combat were popular sports in the European middle ages, modern international fencing owes more to unarmoured 16th century rapier combat. Rapiers evolved from cut-and-thrust military swords, but were most popular amongst civilians who used it for self-defense and dueling. Rapier fencing, with it’s thrusting attack, spread from Spain and Italy to northwest Europe. Innovations, such as linear fencing and the lunge, were introduced by Italian masters in the early 17th century. By the 18th century, the rapier had evolved to a simpler, shorter, and lighter design that was popular in France as the small sword. The weapon was used exclusively for thrusting and the light weight made a more complex and defensive style possible. The French masters developed a school based on defense with the sword, subtlety of movement, and complex attacks. This small sword was known as le fleuret, and was identical in use to the modern foil. By the mid-19th century, dueling not as popular as a means of settling disputes because victory could lead to a jail term for assault or manslaughter. Emphasis shifted to defeating the opponent without necessarily killing him. Less fatal dueling forms evolved using the dueling sword, or epee de terrain. Later, duels often ended with crippling thrusts to the arm or leg which became the basis of modern epee fencing. Broadswords, sabres, and cutlasses were used extensively in military circles, especially by cavalry and naval personnel. Training was performed with wooden weapons and stick fighting which remained popular until Italian masters formalized sabre fencing into its non-fatal training form with metal weapons in the late 19th century. Early sport sabres were significantly heavier than the modern sport sabres but evolved into the lighter, less fatal dueling form in Italy and Germany. Hungarian masters developed a new school of sabre fencing that emphasized finger control over arm strength that dominated sabre fencing for most of the 20th century. Dueling faded away after World War I but has been included in every modern Olympics since 1896 as one of only five sports to do so. The first modern Olympic games featured foil and sabre fencing for men only. Epee was introduced in 1900. Epee scoring was electrified in the 1936 games, foil in 1956, and sabre in 1988. Women’s foil was first contested in the 1924 Olympic games, and Women’s epee was only contested for the first time in 1996, although it has been part of the World Championships since 1989. Women’s sabre made its first appearance in the 1998 World Championships as a demonstration sport and finally appeared in the 2004 Olympics. Foil—a light thrusting weapon that targets the torso, including the back, but not the arms. Hits are scored only with the tip; hits with the side of the blade do not count. Only a single hit can be scored by either fencer at one time. 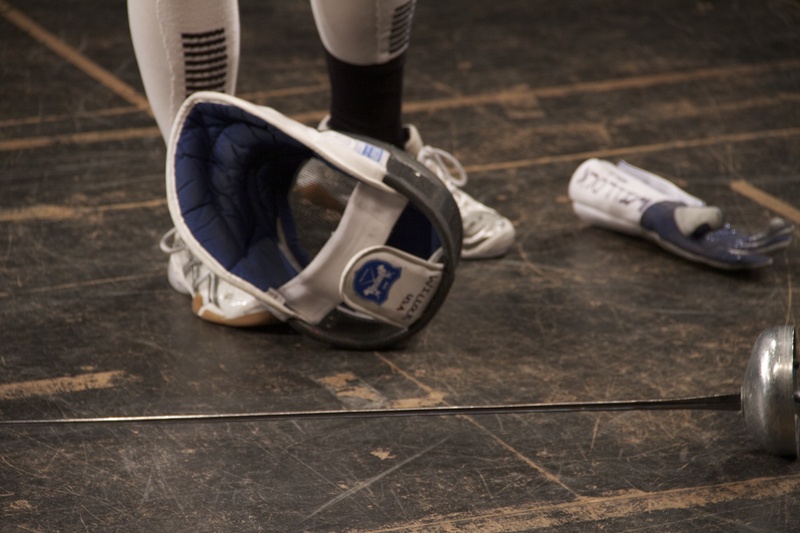 If both fencers hit at the same time, the referee uses the rules of “right of way” to determine which fencer gets the point. Sabre—a light cutting and thrusting weapon that targets the entire body above the waist, except for the hands. The sabre is primarily used to slash, so hits with the side of the blade as well as the tip are valid. “Right of way” applies—only one fencer can score at a time. Epee—a heavy thrusting weapon that targets the entire body. All hits must be with the tip and not the sides of the blade. Unlike foil and sabre, Epee does not use right of way, and allows simultaneous hits by both fencers. In the event of both fencers making a touch within 40 milliseconds of each other, both are awarded a point (a double touch). A hit must arrive with a force of at least 7.35 newtons and the push-button must remain fully depressed for 1 millisecond. All hits register as valid, unless they land on a grounded metal surface, such as a part of the opponent’s weapon, in which case they do not register. At large events, grounded conductive pistes covert the floor to prevent the registration of hits to the floor.